A proper introduction to each experiment is given through the ‘Theory tab’. There is also an online procedure for each of the experiments under the 'Procedure' tab that gives detailed step by step instructions on how to perform the experiment in a traditional lab and also how to use the simulator. The Animations help a student gain understanding of how to perform the experiment with hints and tool tips that show measurements, working of the equipment and other relevant information. The 'Video' tab shows the video of the experiment as done in a traditional lab. The Simulation can be used to perform the experiment interactively. 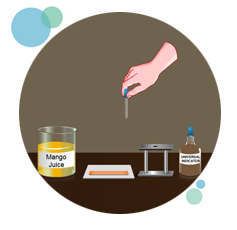 The experiment can be performed by clicking on the 'Simulation' tab and following the step-by-step instructions as given in the ‘Procedure’ tab. Facilities are also provided for a student to check the result obtained.